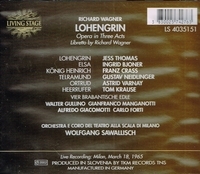 “In the Norwegian Radio production of GÖTTERDÄMMERUNG, mounted for Kirsten Flagstad in 1956, Ingrid Bjoner sang the Third Norn and Gutrune; and in 1957 she not only made her début with the Norwegian National Opera in Oslo as Donna Anna, but also sang the title rôle in Handel’s RODELINDA at the Drottningholm Festival at the invitation of Flagstad. Between 1957 and 1959 Bjoner was a member of the Wuppertal Opera and of the Deutsche Oper am Rhein in Düsseldorf-Duisburg between 1959 and 1961. She made her first appearance at the Vienna State Opera in 1959 and sang there regularly until 1986 in parts such as Desdemona, Leonore, Rezia, and the title rôles in ARIADNE AUF NAXOS and TURANDOT. In 1960 she made her débuts in San Francisco as Elsa and at the Bayreuth Festival as Freia, Helmwige, and Gutrune in DER RING, conducted by Rudolf Kempe. Bjoner joined the Bavarian State Opera in Munich in 1961, where she sang the Empress in DIE FRAU OHNE SCHATTEN at the reopening of the National Theatre in 1963, as Isolde at its centenary performance in 1965, and the Marschallin in 1966. Her Metropolitan Opera début came in 1961 with Elsa, and she sang there regularly until 1967 where her rôles included Ariadne, the Countess in LE NOZZE DI FIGARO, Donna Anna, the Empress, Eva and Gutrune. While in New York Bjöner sang the Duchess of Parma in the American première of Busoni’s DOKTOR FAUST at Carnegie Hall in 1964. She first appeared at La Scala, Milan, as Elsa in 1965 and at Covent Garden in 1967 as Senta, returning in the same year to sing Sieglinde and Leonore, a rôle which she sang at the Salzburg Festivals of 1969 and 1970 and in which she made a return to the Metropolitan Opera in 1971. During the 1970s Bjoner sang in major opera houses, including those of Berlin (Deutsche Oper), Copenhagen, Madrid, Milan, Oslo, Pittsburgh, Stockholm and Stuttgart as well as at the Bayreuth Festival. Her first appearances at the Paris Opéra were in 1972, as Isolde and Tosca. She both directed and sang the title part in Elektra in Oslo in 1985, repeating this feat in Copenhagen during the following year, when she also sang Isolde at Bayreuth and the Kostelnička at Karlsruhe. Bjoner recorded Elektra for Italian Radio in 1987 and returned to Munich in 1988 to sing the Empress. Her last operatic performance was at Karlsruhe in 1990, again with the Empress; she continued however to be active as a teacher in both Oslo and Copenhagen. "The dramatic soprano Astrid Varnay was born into an operatic family: her mother was a coloratura soprano and her father a spinto tenor. The year in which she was born they founded the Opera Comique Theatre in Kristiania, Sweden, although they were both born in Hungary, and they managed it until 1921. The family then moved to Argentina and later to New York, where her father died in 1924. Her mother subsequently remarried another tenor, and the young Astrid, after studying to be a pianist, decided at the age of eighteen to become a singer. She worked intensively, first with her mother and then with the Metropolitan Opera conductor and coach Hermann Weigert, whom she later married. She made her sensational stage début at the Metropolitan in 1941, substituting at short notice for Lotte Lehmann as Sieglinde in DIE WALKÜRE with no rehearsal. After this triumph, six days later she replaced Helen Traubel in the same opera as Brünnhilde, and her operatic career was effectively launched. She made her Covent Garden début in 1948 and, at the suggestion of Kirsten Flagstad, her Bayreuth Festival début in 1951. She sang every year at Bayreuth for the next seventeen years and at the Met until 1956, when she left following a disagreement with Rudolf Bing. She henceforth concentrated her career on Germany where she was revered, living in Munich. She moved from the dramatic soprano repertoire into that for mezzo-soprano in 1969, and during the 1980s into character parts. She made her last appearance in Munich in 1995, almost fifty-five years after her Metropolitan début. Her brilliant career is well documented in both commercial and unofficial sound recordings."